April 18, 2019. ARTICLE: Lamenting a Disappearing Chinese Art Form [South China Morning Post] Professor Chi Wang details his experience with calligraphy and collecting Chinese artwork, and how such practices are disappearing today. Read More. April 12, 2019. 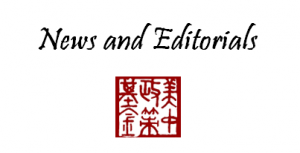 OP-ED: In China, a Divided America Finds a Foe to Unite Against [South China Morning Post] As the US political divide deepens, China is becoming an increasingly attractive distraction for politicians, the media, and the American public. Read More.